This technology paper contains explanations of key terms related to Antenna technology. Selection of the right antenna is key to ensure successful design and implementation of a Wireless Network. 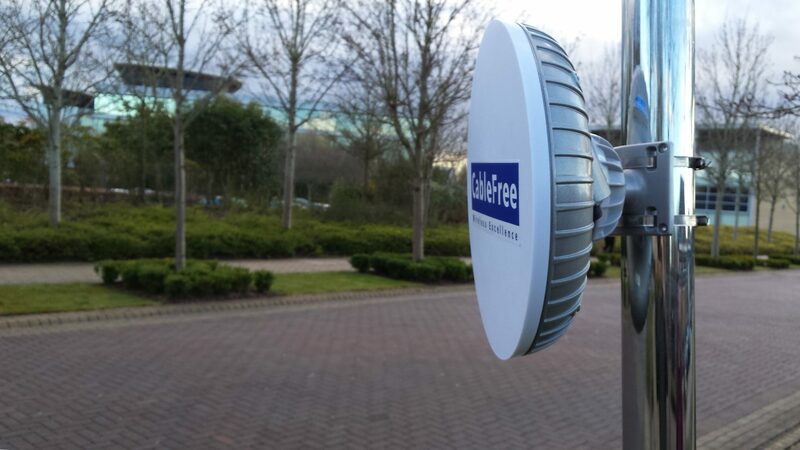 Our goal is to ensure you can understand and choose the correct CableFree antenna for your application – if in doubt, please Contact Us and our team of experts will guide you to ensure you have the correct antennas. In electromagnetics, an antenna’s power gain or simply gain is a key performance number which combines the antenna‘s directivity and electrical efficiency. As a transmitting antenna, the gain describes how well the antenna converts input power into radio waves headed in a specified direction. As a receiving antenna, the gain describes how well the antenna converts radio waves arriving from a specified direction into electrical power. When no direction is specified, “gain” is understood to refer to the peak value of the gain. A plot of the gain as a function of direction is called the radiation pattern. Antenna gain is usually defined as the ratio of the power produced by the antenna from a far-field source on the antenna’s beam axis to the power produced by a hypothetical lossless isotropic antenna, which is equally sensitive to signals from all directions. Usually this ratio is expressed in decibels, and these units are referred to as “decibels-isotropic” (dBi). An alternative definition compares the antenna to the power received by a lossless half-wave dipole antenna, in which case the units are written as dBd. Since a lossless dipole antenna has a gain of 2.15 dBi, the relation between these units is: gain in dBd = gain in dBi − 2.15 d. For a given frequency, the antenna’s effective area is proportional to the power gain. An antenna’s effective length is proportional to the square root of the antenna’s gain for a particular frequency andradiation resistance. Due to reciprocity, the gain of any antenna when receiving is equal to its gain when transmitting. The radiation pattern of an antenna is a plot of the relative field strength of the radio waves emitted by the antenna at different angles. It is typically represented by a three-dimensional graph, or polar plots of the horizontal and vertical cross sections. The pattern of an ideal isotropic antenna, which radiates equally in all directions, would look like a sphere. Many nondirectional antennas, such as monopoles and dipoles, emit equal power in all horizontal directions, with the power dropping off at higher and lower angles; this is called an omnidirectional pattern and when plotted looks like a torus or donut. The radiation of many antennas shows a pattern of maxima or “lobes” at various angles, separated by “nulls“, angles where the radiation falls to zero. This is because the radio waves emitted by different parts of the antenna typically interfere, causing maxima at angles where the radio waves arrive at distant points in phase, and zero radiation at other angles where the radio waves arrive out of phase. In a directional antenna designed to project radio waves in a particular direction, the lobe in that direction is designed larger than the others and is called the “main lobe“. The other lobes usually represent unwanted radiation and are called “sidelobes“. The axis through the main lobe is called the “principal axis” or “boresight axis“. The space surrounding an antenna can be divided into three concentric regions: the reactive near-field, the radiating near-field (Fresnel region) and the far-field (Fraunhofer) regions. These regions are useful to identify the field structure in each, although there are no precise boundaries. In the far-field region, we are far enough from the antenna to neglect its size and shape. We can assume that the electromagnetic wave is purely a radiating plane wave (electric and magnetic fields are in phase and perpendicular to each other and to the direction of propagation). This simplifies the mathematical analysis of the radiated field. As an electromagnetic wave travels through the different parts of the antenna system (radio, feed line, antenna, free space) it may encounter differences in impedance (E/H, V/I, etc.). At each interface, depending on the impedance match, some fraction of the wave’s energy will reflect back to the source, forming a standing wave in the feed line. The ratio of maximum power to minimum power in the wave can be measured and is called the standing wave ratio (SWR). A SWR of 1:1 is ideal. A SWR of 1.5:1 is considered to be marginally acceptable in low power applications where power loss is more critical, although an SWR as high as 6:1 may still be usable with the right equipment. Minimizing impedance differences at each interface (impedance matching) will reduce SWR and maximize power transfer through each part of the antenna system. Complex impedance of an antenna is related to the electrical length of the antenna at the wavelength in use. The impedance of an antenna can be matched to the feed line and radio by adjusting the impedance of the feed line, using the feed line as an impedance transformer. More commonly, the impedance is adjusted at the load (see below) with an antenna tuner, a balun, a matching transformer, matching networks composed of inductors and capacitors, or matching sections such as the gamma match. The polarization of an antenna refers to the orientation of the electric field (E-plane) of the radio wave with respect to the Earth’s surface and is determined by the physical structure of the antenna and by its orientation; note that this designation is totally distinct from the antenna’s directionality. Thus, a simple straight wire antenna will have one polarization when mounted vertically, and a different polarization when mounted horizontally. As a transverse wave, the magnetic field of a radio wave is at right angles to that of the electric field, but by convention, talk of an antenna’s “polarization” is understood to refer to the direction of the electric field. Reflections generally affect polarization. For line-of-sight communications or ground wave propagation, horizontally or vertically polarized transmissions generally remain in about the same polarization state at the receiving location. Matching the receiving antenna’s polarization to that of the transmitter can make a very substantial difference in received signal strength. Polarization is predictable from an antenna’s geometry, although in some cases it is not at all obvious (such as for the quad antenna). An antenna’s linear polarization is generally along the direction (as viewed from the receiving location) of the antenna’s currents when such a direction can be defined. For instance, a vertical whip antenna or Wi-Fi antenna vertically oriented will transmit and receive in the vertical polarization. Antennas with horizontal elements, such as most rooftop TV antennas in the United States, are horizontally polarized (broadcast TV in the U.S. usually uses horizontal polarization). Even when the antenna system has a vertical orientation, such as an array of horizontal dipole antennas, the polarization is in the horizontal direction corresponding to the current flow. The polarization of a commercial antenna is an essential specification. Polarization is the sum of the E-plane orientations over time projected onto an imaginary plane perpendicular to the direction of motion of the radio wave. In the most general case, polarization is elliptical, meaning that the polarization of the radio waves varies over time. Two special cases are linear polarization (the ellipse collapses into a line) as we have discussed above, and circular polarization (in which the two axes of the ellipse are equal). In linear polarization the electric field of the radio wave oscillates back and forth along one direction; this can be affected by the mounting of the antenna but usually the desired direction is either horizontal or vertical polarization. In circular polarization, the electric field (and magnetic field) of the radio wave rotates at the radio frequency circularly around the axis of propagation. Circular or elliptically polarized radio waves are designated as right-handed or left-handed using the “thumb in the direction of the propagation” rule. Note that for circular polarization, optical researchers use the opposite right hand rule from the one used by radio engineers. It is best for the receiving antenna to match the polarization of the transmitted wave for optimum reception. Intermediate matchings will lose some signal strength, but not as much as a complete mismatch. A circularly polarized antenna can be used to equally well match vertical or horizontal linear polarizations. Transmission from a circularly polarized antenna received by a linearly polarized antenna (or vice versa) entails a 3 dB reduction in signal-to-noise ratio as the received power has thereby been cut in half.